Tony Clark's shows have been critically acclaimed box office successes. This is the result of a 30 year gathering storm of experience on and off stage working with hundreds of variety acts from around the world. Tony Clark and his cutting edge production team specializes in creating high quality shows that artistically fit your venue while financially fitting your budget. Quality shows that make money is our mantra with a track record to prove it. You can have everything from Street magic projected on video screens to Mega Illusions surrounded with beautiful dance production numbers and cutting edge variety acts. 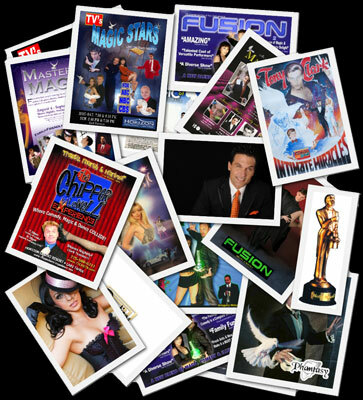 We also specialize in assisting with unique promotional ideas by creating spectacular publicity stunts that attract FREE press and television coverage bringing instant awareness to your new show or event. Click here a death defying stunt that drew thousands of people in Lake Tahoe. New shows are constantly being created. Contact us to find out how we can build a successful money making show for you!